ARTS IN EDUCATION SPOTLIGHT: Join us for an upcoming Creative Aging event! 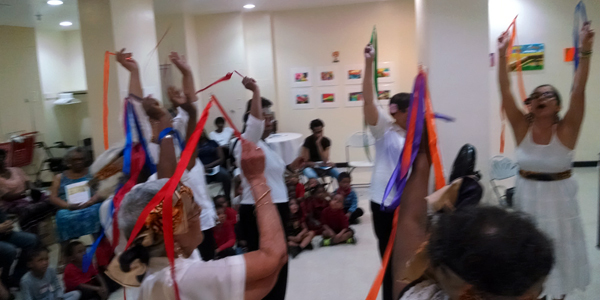 Ribbon dance enhances a creative movement and music call & response performance at Phillip Howard Senior Center with teaching artist Yelimara Concepcion. This spring, 22 creative aging programs have engaged seniors in everything from memoir writing to line dance, creative movement to chorus, theatrical readings to exhibitions of prints, paintings, murals, and sculpture! Join us this June for events at senior centers throughout Brooklyn, celebrating and sharing the artistic work of these seniors. Seniors Partnering with Artists Citywide (SPARC) is a community arts engagement program that places artists-in-residence at senior centers across the five boroughs of New York City. In addition to the 13 SPARC programs, BAC creative aging programs include professional performances at senior centers, teaching artist residencies, and workshops! Teaching artist Kate Bell is devising theater with seniors at Park Slope Senior Center and Renée Manning & Douglas Booth are leading a chorus at Prospect Hill Senior Center through the support of Councilmember Lander. At St. Augustine and Phillip Howard Senior Centers, BAC teaching artists Pamella Allen, Cheryl Paswater, Yelimara Concepcion, and Earlene Greene are leading visual arts and dance residencies supported by Councilmember Williams. Join us this June in celebrating and sharing the artistic work seniors have been engaged in this spring! Keep checking the BAC calendar as we continue adding events.